A promising handset that now has the correct price tag to boot - a lot of Facebook fans are going to be picking this up in the near future. Last year, we saw the INQ Chat 3G and INQ Mini 3G, promising Facebook integration on a budget - but sadly, thanks to quite poor processing, neither really stepped up to the task. Fast forward to 2011, and the company has come back with the INQ Cloud Touch an Android-powered smartphone that keeps the budget tag, and shoves not only Facebook, but Spotify too deeper into the phone than anything on the market - and TechRadar has nabbed the first model to bring you our exclusive UK INQ Cloud Touch review. The 'budget' tag is one that many phone brands have struggled with in the past, as it's too easy to skimp on features or design in order to bring the handsets in at the correct price point. The Orange San Francisco is the only success we've really seen, with a high-res screen and slick OS all for £90. The INQ Cloud Touch costs £199.95 on PAYG or just £18 on contract, so while it's not in the same category price wise, it's still very much cheaper than the £500+ price mark of the likes of the iPhone 4 and Samsung Galaxy S2. 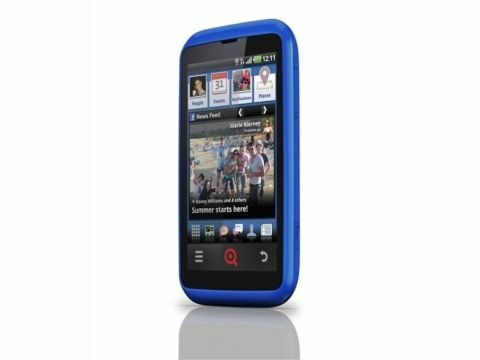 The INQ Cloud Touch is a cute little handset, there's no doubt about that. Covered in a rounded plastic chassis that comes in red and white, the phone feels a little light in the hand, but nothing too bad. The design ethos is clearly cheerful and chirpy, and the smooth edges and large front icons certainly help facilitate that. The front of the phone houses three touch-sensitive buttons (Menu, Home and Back), although there's no front-facing camera to speak of. But it's on the sides that INQ has decided to place its innovative keys, and we're big fans. On the top left-hand side, a flush key sits with a small 'i' icon on - this is the info key that delivers pertinent information when pressed from any point in the phone. It's a nice touch, and easy to use no matter how you're holding the phone; plus it has a smooth pressing action. The top of the INQ Cloud Touch has the microUSB slot (uncovered), 3.5mm headphone jack and power/lock key. We always like to see a cap for our charger slot (after the horrific breakfast jam tragedy of 2009) and the power button is a little hard to hit as it's part of the curved chassis. It's not terrible, but it does feel a little small. The volume rocker switch is on the top right-hand side of the phone, and is easy to operate, although as it's flush it can be hard to hit in the pocket. Below it lives the media key, which is another nifty bit of innovation. Pressing it will open up the Spotify player, giving you easy access to your music or the full Spotify experience (depending on whether you're a Premium user or not). The INQ Cloud Touch is the first phone to bring an offline Spotify experience (ie you don't need to pay £9.99 a month to use the app), and it's good to see access is hardwired to the phone. The rear of the Cloud Touch looks similarly cutesy - the camera sensor has a plastic ring around it to look oversized, next to a speaker grille with the same dimensions to offer an experience that looks ever so slightly like a face. Weird, but kind of cool if you like Hello Kitty merchandise. Overall, the INQ Cloud Touch feels nice in the hand - it sits well and the 3.5-inch screen, with WVGA resolution, looks clear and is easy to reach. It doesn't pack a weighty, premium feel, but it does have a lot of style and will appeal to many looking for a cheaper phone.